More details are now available for the latest Tyler Perry release coming in November. 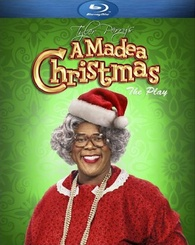 As previously reported, Lionsgate says 'A Madea Christmas: The Play' is coming to high-definition on November 22. Specs have yet to be revealed, but supplements will include behind-the-scenes interviews and bloopers. You can find the latest specs for 'A Madea Christmas: The Play' linked from our Blu-ray Release Schedule, where it's indexed under November 22.